​​CLEAR LAKE – Emmons Motor Co., an automotive stalwart that's been operating in Houston for nearly 50 years, is relocating and quadrupling its footprint. The used car dealership will relocate to 16 acres at I-45 and Farm to Market Rd. 528 in the Clear Lake area. Emmons Motor Co. currently operates on four acres in Pasadena at 3301 Shaver St. That property will be leased out to another user. The total cost of the project is estimated at $15 million. It's scheduled to break ground soon and will deliver in November 2017. 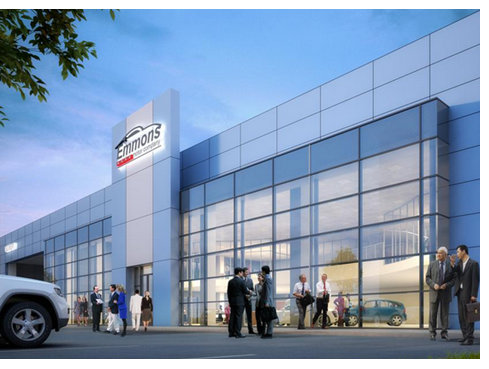 The new 48,000-sf dealership will be able to hold roughly 450 cars on-site, up from Emmons' current Pasadena location that can handle roughly 350 cars. The new dealership will also include a state-of-the-art public body shop, a waiting area, an 18,000-sf showroom and more.